The amount of bonds in the lowest investment-grade category (BBB, red in the chart below) has ballooned by 262%, from $820 billion to $3.0 trillion. 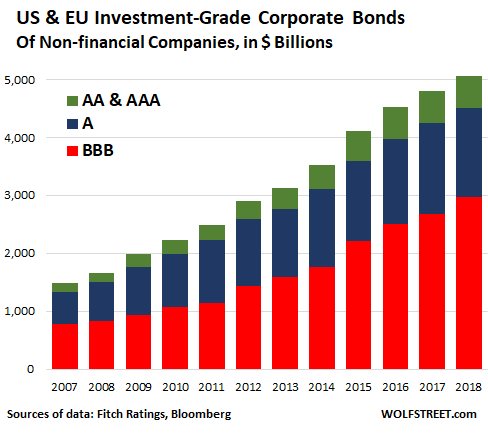 But the amount of higher- and highest-rated bonds (categories A, AA, and AAA, green and blue in the chart below) has increased “only” 147% – though that’s a huge increase too – from $842 billion to $2.1 trillion. Can Dumb and Dumber save the day? Spot on. I think this is a point recession watchers are missing. You dont need recession for markets to take a knock. The process may work reverse. A unchecked credit event (ILFS in India) drags stock prices (even as company behind credit events acts in a rational manner to contain crisis) down, and wealth effect drags the economy on its edge. The US government has very little explicit defense, the US Fed can moderately support.